Finding a company in today’s economy that continues to add benefits for employees is hard enough but when a company adds benefits that add value to both the employee and to the company pays off in a big way. Several local companies are finding positive results in providing quality language services as a company offered benefit. Gannon & Gannon Language School has been providing quality language courses in Sofia since 2006 and is now offering them to Sofia based businesses as a employee enrichment service. By offering courses from beginners through advanced business management in English, Gannon & Gannon provides a wide choice of services that range from evaluation to certification. The Gannon & Gannon language school is a partner of the IEERA, a global provider of TESOL testing and certification services and brings these services to Sofia. Learning the English language is not meant to be a difficult process and shouldn’t be taught as such. Our instructors provide an easy to learn and use atmosphere to allow your employees to gain the knowledge and verbal practice of the language to use it as they learn it. Whether your employees are starting as beginners or brushing up on the skills that they have, these courses will add value and satisfaction to both the company and employee. The Gannon & Gannon Language School was founded by Dennis and Petia Gannon with the goal of providing a better understanding and a higher level of proficiency of the English language through professional teaching and training. We believe that learning and using the English language is an important part of the educational system. We also strongly believe that using the English language doesn’t just mean reading and filling in pre-set exercises, but by being able to understand and communicate in both oral and written form. The Gannon & Gannon Language School is happy to announce that they have signed the first corporate client to the schools consulting, testing and advanced language instruction services. This follows several discussions concerning the experience and quality of present and future employees where the English language is needed to remain competitive in today’s business world. In order to provide superior services, companies in today’s market must take advantage of superior opportunities. During a class, a representative from a Sofia based IT Company had raised concerns, expressing the need to maintain their employee communication and documentation skills. The request was then made concerning the possibility of providing on-site services. After careful deliberation and consideration of all evolved, the testing and assessment was carried out to determine the extent of services needed. Although this service has been requested in the past, Gannon & Gannon had not offered this service. At the end of the meeting Gannon & Gannon had decided to extend their present one-on-one and group training to encompass the growing corporate need for the services needed. Based on a case by case need, Gannon & Gannon will be providing “On-Site” consulting, testing and language instruction to meet the corporate needs. The Gannon & Gannon Language School was founded by Dennis and Petia Gannon in 2006, with the goal of providing a better understanding and a higher level of proficiency of the English language through professional teaching and training. Education is an important tool in any industry and should be made available to everyone. We believe that learning and being efficient in the English language is an important part of the educational system. Knowing the English language doesn’t just mean reading and writing but by being able to understand and communicate with others. 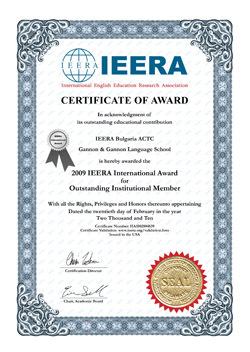 February 2010 – Gannon & Gannon Language School has been awarded the IEERA International Award for Outstanding Institutional Member for the year of 2009.